Some familiar faces played the heroes in a pair of Aurora wins to close out the OJHL preseason schedule over the weekend. 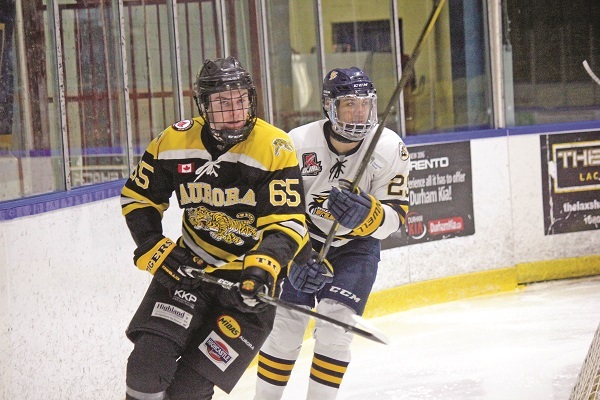 A pair of losses to open up the year was followed by a 3 – 2 win over the Whitby Fury on Friday, a contest that took just over four periods of play before Tigers veteran Joseph Mizzi potted the winner in double overtime. Markus Patterson and Michale Palandra also netted their first goals in the Tigers’ black and gold, each in the first period. They closed out the preseason the following night on the road to face the Toronto Jr. Canadiens, where fellow veteran Luca Esposito put up a two-goal performance in another 3 – 2 win. Christian Fillipetti of Nobleton had a strong debut in net in the contest, with the sixteen-year old making 35 saves for the win. The prospects for a repeat season as Conference champions are already high: the Tigers were one of just two OJHL teams to make the grade on the Canadian Junior Hockey League’s top-twenty list, released late last week. Entering at eighteenth in the nation, Aurora trails only the high-powered Wellington Dukes within Ontario, who was tabbed at number three. The two heavyweights will first get a look at each other on Sept. 25 when the Tigers visit the Dukes. In the meantime, the Battle of Yonge Street will be renewed on Sept. 14 for Aurora’s home opener, hosting the Newmarket Hurricanes for a Friday night contest one night after they compete at Newmarket’s Ray Twinney Arena. “We want to promote competition as much as we can,” said Savoy in a statement. This year’s competition will certainly have a new look for the Tigers: if they are to once again reign at the top of their conference, it will have to be as NorthWest champions rather than NorthEast, a move approved by the league in July. A longtime battle with the Lindsay Muskies will be cut short after the Muskies moved conferences in the offseason, leaving just one Tigers-Muskies game on the regular season schedule. Burlington, Oakville, Georgetown, and Buffalo join the Conference in the West division, as well as the new-look Brampton Admirals and Brantford 99ers, formerly the Orangeville Flyers and Milton IceHawks respectively. Aurora will face each of Newmarket, Markham, Pickering, and Stouffville, the other members of the North division, seven times throughout the schedule. The season wraps up in late February.